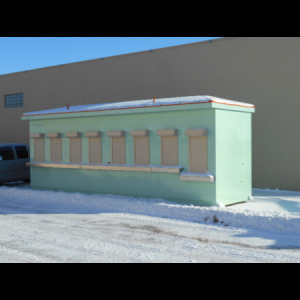 Little Buildings Portable Box Office / Ticket Booth features 8 ticket windows, standing seam metal roof, stainless steel exterior money shelf, painted steel interior counter, 3" canopy overhang, swinging steel door, elevated treadplate floor, and much more! Shipped totally assembled, ready to set, connect, and use. Pick a paint color, select from many options such as roll-down security shutters and sun shades, exterior lighting, automatic ticket machine mounting, floor safe, cash drawers, forklift pockets, data outlets, tile floors, and you&apos;re ready to go! The ability to relocate the unit makes this Little Building more valuable to your venues. This Portable Box Office can be made in various sizes with the same look. Pick your color and options!